A best friend is the one special person that we can lean on in times of trouble and the one we share our deepest secrets and thoughts with. They act as our sibling, parent, adviser, and companion all at the same time. For once in our life, we get to meet someone whom we can call our best friend. They know who we are from the inside out and have accepted us fully. The term BFF or best friends forever has come to popularity in the recent years to solidify the friendship that we have with them. We sure are invited when a best friend celebrates his special day. To make it more memorable, we have to give them a birthday card that stands out from the others. A unique birthday card is the best option for that. It is small, personal and funny at the same time. For a person who knows all of our quirks, bad habits and can stand our craziness, they deserve something exceptional from us. 1. Choose the right paper to use. Special kinds of papers are used to make a simple birthday card. These are sturdier than the usual paper. They are also available in bookstores. For the color, white goes well with any design that you can use. The size of the birthday card should only be small. 2. Find something that symbolizes him/her. You can pick a thing or a symbol that is close to the heart of the celebrant. Put it in the center of the card. 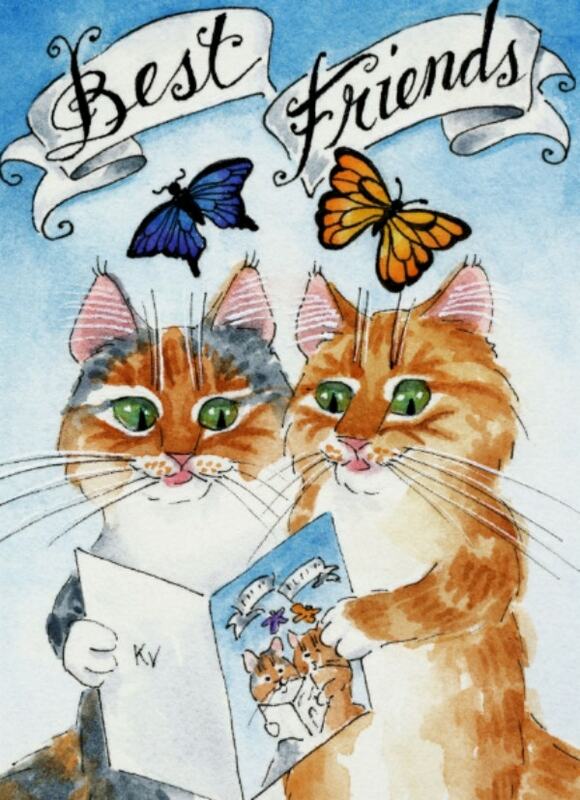 Your best friend will surely like receiving a card with a symbol that reflects the real him. It can be an animated character or anything that he holds dear. You may also see printable birthday cards. 3. Write a funny joke on the cover. 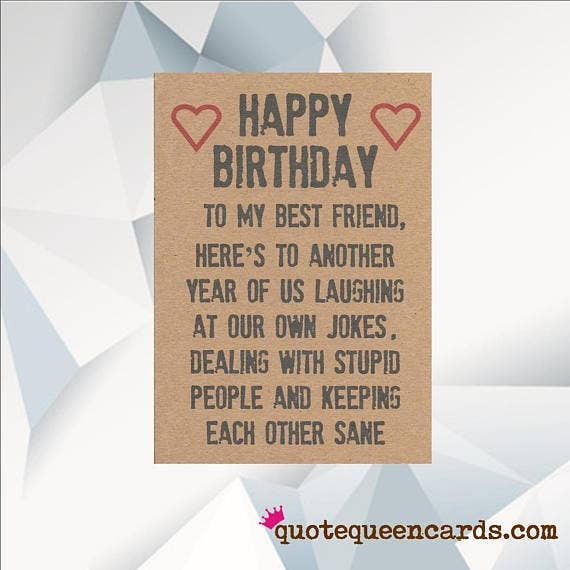 Another option for designing the BFF birthday card is writing a funny joke on its cover. 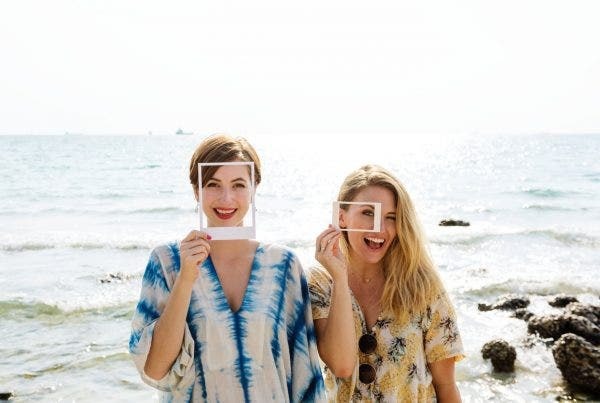 It can be some sort of an inside joke between the two of you, a wordplay, or a joke that is known by everyone and relatable to your best friend. You may also see birthday card templates in a word. 4. Write a sincere message. Since a BFF birthday card is small in size, condense your thoughts into a sentence. One sincere message can lift your best friend’s mood and make everything better. You may also see funny birthday card templates. Life is fast-paced. We start making friends as early as childhood. As we grow older, we learn to strengthen them and keep those who are worthy of keeping. We get to realize that some friendships last a lifetime while some don’t. That’s where we know that they are worth keeping and we have to do everything to keep the friendship alive and strong. You may also see e-mail birthday cards. Communication is very important in friendships. Make an effort to say hi to them personally or drop them a message if you live far from each other. Talk to them everyday about random stuff. From there, you can talk a lot of things and keep the conversation going. You have an idea of what happens in each other’s lives. You may also see birthday card psd. 2. Help them out in trouble. It is inevitable to get caught in trouble at times because of wrong decisions and a twist of fate. Whatever happens, you should be there to help your friend out. Talk to him about the real problem and you find a solution together to solve it. You would be surprised at how far you will go after everything that happened. You may also see free birthday cards. Make sure to schedule a day where you are both free. Meet up at a cozy coffee shop or have a food trip in your home so you can talk about anything and everything about life. Be open to them. Since you’re best friends, there’s no room for judgment. Spending time with each other helps you in keeping your friendship strong. 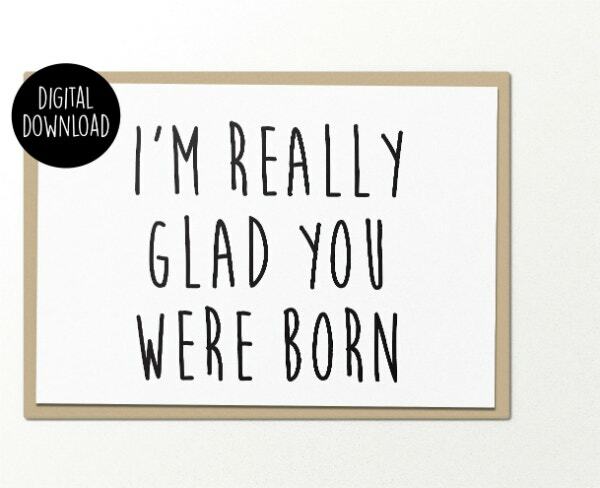 You may also see free printable birthday cards. Everyone has a dream, and your best friend is not an exception. Whatever that dream is, give your full support and love. Be his number one cheerleader and supporter. You will feel pride at how he slowly works on making his dream come true if he gets the support he needs. You may also see free animated birthday cards. You don’t have to expect much from a person. As they say, expectations lead to heartbreak. Let him blossom into the person he is meant to be. Do not box him and let him achieve his dreams. The higher the expectations, the more pressured he feels. As a friend, you are there to cheer him on and hold him while he’s breaking down. 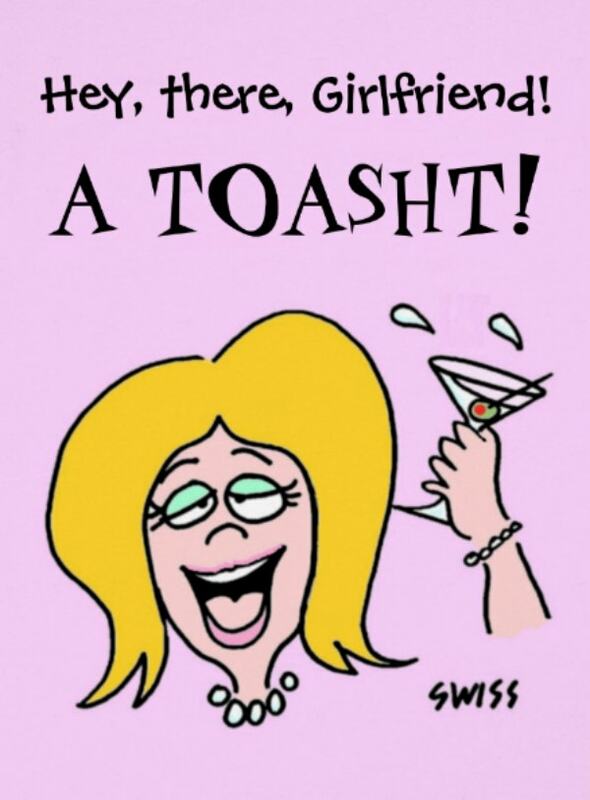 You may also see funny happy birthday cards. 6. Keep the jealousy in check. Jealousy can exist even in the best of friendships. Just because he is your best friend does not mean his world only revolves around you. Allow yourselves to have other friendships and welcome people into your circle. There’s nothing wrong with having another set of friends as long as you’re still there for each other. You may also see blank birthday templates. Everyone has flaws and bad attitude they are trying hard to break away from. As a friend, accept them for it as much as they accept you for who you are as well. Acceptance is a strong foundation for a good friendship. You don’t have to shy away from the person because you have accepted them fully. You may also see word format birthday templates. You don’t have to tolerate what your friend does all the time. Sometimes you have to prove your point and tell them they’re wrong. You have to give them a taste of their own medicine. You need to make them realize that you’re not buying any of their unlawful behavior. Being upfront also means telling the truth at all costs. You have to be honest about how you feel. You may also see happy birthday email templates. 9. Be a good listener and adviser. When a friend is in need of a good one-on-one talk, prepare your heart, mind, and mouth in absorbing all his stories and emotions. Give him some advice on how to get out of his bad situation. There’s nothing better than a friend who listens in times of heartbreak and disappointments. You may also see birthday flash cards. 10. Be there for each other. This is pretty much an unspoken rule in every friendship. Thick and thin, rain and shine, stand by each other’s side all the time. You may also see birthday invitation postcards. Friendship has taken a whole new route since the beginning of the digital age. The most popular way of making friends online is through social media. You add a friend on Facebook, follow someone on Twitter and Instagram, and drop a random message for a person on WeChat, and the friendship starts from that. Social media has offered more ways to connect with friends and loved ones. We get to be tagged in posts, comment on photos and videos posted by our friends and celebrate anniversaries despite the distance. Social media has successfully broken barriers in friendship. On the other hand, it can also ruin friendships since the messages are stored in the accounts and can be used for screenshot purposes. Social media shaming is rampant nowadays. You may also see frozen birthday invitation templates. Another thing to take note of is the portrayal of friendship on screen. That includes on television, movies, music videos, and other digital content. Friendship is portrayed as strong, flimsy and sometimes hilarious depending on the storylines. It is also the vantage point of a romantic relationship, which is the most common trope for romance movies. Over the years, the portrayal of friendship has shed light on us viewers on its simplicity and complexity. While friendship can all be fluffy and colorful, it can sometimes be ruined and go to the darker side of things. You may also see printable birthday invitation templates. If this article is helpful for you, read up some other related content on birthday cards. Best friend birthday cards are really helpful if you want to spend less but give more love to the one person who understands and accepts everything about you. You may also see card templates. The best friendships are encountered once in a lifetime. Time does not matter as long as you have that mutual connection and loyalty with each other. A best friend is a brother or sister from another parent and an exact complement of who we are as a person. You may also see birthday templates.